Ingenta Open delivers tens of thousands of Open Access books, monographs and articles to researchers worldwide. Built on the Ingenta CMS platform, it uses the latest technology for comprehensive interdisciplinary discoverability and seamless content delivery. For publishers, Ingenta Open offers a cost-effective hosting solution for your OA content. A fully supported service, we supply statistical reports and a range of bolt-on elements to make the entire publishing process simpler. 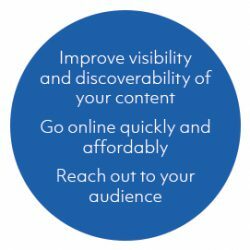 Benefit from a pre-engaged audience of millions, ready to find your content. Completely free and open access for researchers and public. Select additional features available through specially selected third party technology providers. Visit the Ingenta open access platform and discover the benefits of open access content. As members of OASPA, content hosted on Ingenta Open complies with the required accessibility and citation linking standards. We can provide technical support and management of your CrossRef membership and key discovery services such as TrendMD, Google Scholar, EBSCO Discovery Service, Primo Central, WorldCat and Summon research tools. If you like Ingenta Open you may also be interested in some of our other publishing platforms which provide a holistic range of solutions for online discovery, or a platform to help manage your IP.